When I was born I was adopted as an infant. I was raised in a normal white home, and had no contact with my culture or spiritual feelings until I was much older. I spent my childhood, as many children do, trying to do what my parents expected. I recall my parents constantly telling me that I was adopted because they loved me more than my own family had. As the years went by, I soon realized that I was not where I belonged and not doing what I was happy with. In 1992, I began a search for my biological family, and surprisingly to me I was talking to my oldest sister within 45 minutes. I moved home in 1998, and have been getting to know many of my new relatives, and enjoying the area and richness of life here. Although reuniting with a family that lost me so many years ago there have been rough times and good times, but it has been worth it to me. I felt like I needed to know where I came from and who I was, now that I am home I find that there is nothing missing anymore in my heart. The following excerpt was one that I found on the Lost Bird Society website. It is from a book written by Renee Sansom-Flood, who was nominated for a Pulitzer for her work on the original lost bird. A link to the Lost Bird Society follows the excerpt. Below is an excerpt from Renee's book, Lost Bird of Wounded Knee: Spirit of the Lakota, about her experiences as a Social Worker. One day I went to a local hospital with another social worker. 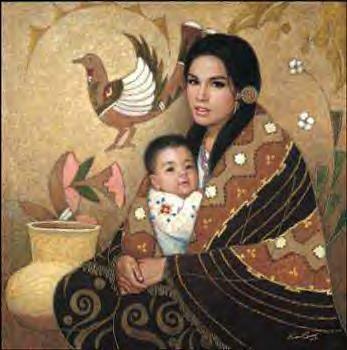 On the maternity ward, we found a young Lakota mother holding her baby boy. She had him wrapped up tightly in a warm blanket, and he was asleep. When the social worker barged in on the mother, she didn't look up. A nurse came and pulled the curtain around us. "Are you having trouble finding a place to stay?" The worker began sympathetically. She gave me a knowing look and she thought the Indian girl hadn't noticed. The girl was scared. Without looking, Indians can read body language like radar. "We just need a ride back to Rosebud," She said softly, still without looking up. Now began the barrage of questions, each unconsciously calculated to destroy the young woman's self-esteem. "How will you raise your child without money?" the worker asked. "What kind of life can you provide for him on the reservation? If you really love your boy, you'd give him a chance in life. We have a long list of good people who can never have children of their own. They have money, beautiful homes. Your baby would have everything; a good education, nice clothes, loving parents, opportunities you can never give him...."
When we got to the state car in the parking lot, I looked back up at the hospital window. There stood the young Lakota mother, her open palms on the window above her head. The worker handed me the baby, and I held him, still looking up at the Lakota girl watching us helplessly as we drove away with her precious child. Here is a beginning to understanding some of the feelings of adoptees, and the people that they touch. I have reunited with my birth family and even though I missed my parents and grandparents, I am able to talk to others who were friends with my parents and can tell me about them. Here are a couple of the links that I have visited and would highly recommend. Please check them out. Lost Bird is the term used to describe native children who were lost to their families through either adoption into non-Native homes or through fostered care. Everyone has the right to know where they came from and what kind of people they come from. Native adoptees around the world need to be found and brought home. Here is a link to a special book about the first Lost Bird. If you would like to find out more about it, please click on the underlined text to go directly to our Barnes and Nobles Affliate link. We have had this many visitors since we first started this page. Thank you for stopping by and we hope that you will visit us again.